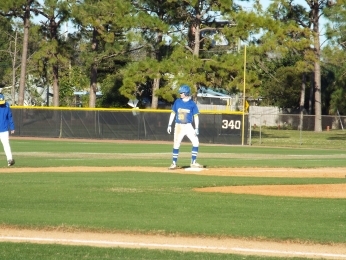 Daniel Redmond awaiting the pitch that sends him to first. Heading into Wednesday afternoon action, both the Canterbury Crusaders and Admiral Farragut Bluejackets were looking for their first win on this young season. The Crusaders bats would not be denied as they powered their way to a 10-5 road victory against the Bluejackets at their home away from home, Walter Fuller Recreation Center. After a scoreless first inning for both teams, Canterbury got going in the second with a leadoff walk to first baseman Daniel Redmond. Redmond wouldn’t stay on first for long as he took off running on the first pitch to teammate Brendon Smith and stole second, one of six total steals for the Crusaders on the afternoon. Two pitches later he made his way to third on a wild pitch, and moments after that, Smith hit a line drive into right field to bring the towering first baseman home. Smith added a stolen base of his own and was brought home later in the inning. The Crusaders bats were still sizzling entering the third inning. Outfielder Bobby Ballew got on base with a beautifully placed bunt single and advanced to second on an error. Much like his teammates in the previous inning, Ballew helped his cause by stealing third and was later brought home by starting pitcher Spencer Landers’ base hit into the outfield. The Crusaders (1-1) tacked on four more runs by the time the third inning was over. 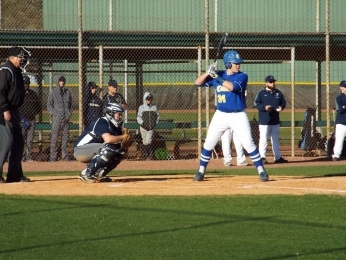 The Bluejackets began to crawl their way back into it during the third and fourth innings by scoring three runs, but in the fifth, the Crusaders were able to load the bases just in time for Redmond to reach the plate again. Redmond sent a blistering ball into left-center field and cleared the bases to give the Crusaders a seven-run lead. Redmond, who finished the day 2-for-2 with three walks and three RBIs, paced the team to victory and was excited to get the first win of the season. Canterbury Crusaders’ manager Dave Smith echoed the importance of Redmond’s big doubles and was quite thrilled to mark the first tally in the win column. Bobby Ballew looks on after stealing a base. Lost in the offensive outburst was starting pitcher Spencer Landers solid performance to pick up the victory. Landers went 5 and two-third innings, throwing 103 pitches, with seven strikeouts. He was quite pleased with the performance from his team and is confident moving forward. Although it wasn’t the outcome the Admiral Farragut Bluejackets (0-3) had hoped for, Manger Tom Beck knows he has a young team, carrying players as young as seventh and eighth grader. He emphasizes being fundamentally sound going forward to really make the leap they know they can make. Next up for the Bluejackets, they will look for their first win of the season at home in a non-district bout with St. Petersburg Catholic on Friday. The Crusaders look for their first winning streak of the season as they are also at home against Cambridge Christian on Friday.